With no shortage of shine on these Dorm Snoozies, you'll help to decorate your dorm simply by walking around! 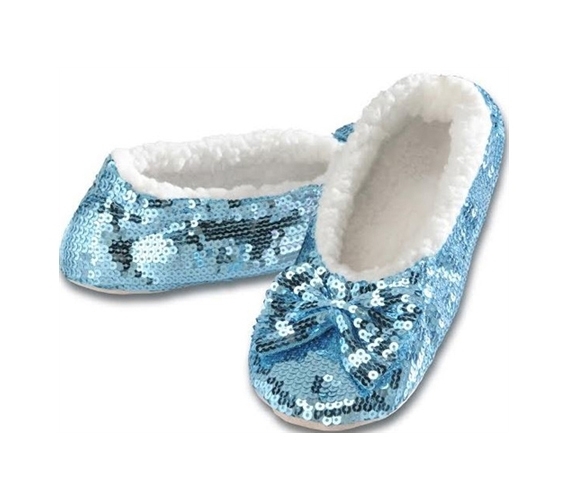 In all seriousness, though, these Dorm Snoozies - Blue Shine will be some of your cutest college supplies. They're not quite slippers but they're not socks either. They're a foot coverings crossover that make ideal dorm supplies for college girls. The bright design of these dorm items also gives them a nice touch of elegance for your college stuff. Who says that decorating your dorm can't include what you have on? Best of all, these Snoozies are also plenty comfy. Their soft inner fleece material will keep feet warm and cozy. In the winter, we don't have to tell you that those dorm floors can get pretty cold, and that if you go barefoot or walk around in socks, it'll be only a matter of time until you're stuck having to put shoes on inside your dorm. Don't let it come to that! Simply include these college supplies as part of your dorm room items and you'll be well prepared. You'll keep feet comfy and warm, which is a priority for dorm life.